When planning your construction project, establishing a budget is one of the first steps in planning a successful project. Setting a plan for where to spend the money, and budgeting for all the work takes both attention to detail and a complete scope of the project. However, there is often times unforeseen issues, or items that come up where additional work will be needed. This is where a contingency budget becomes critical. 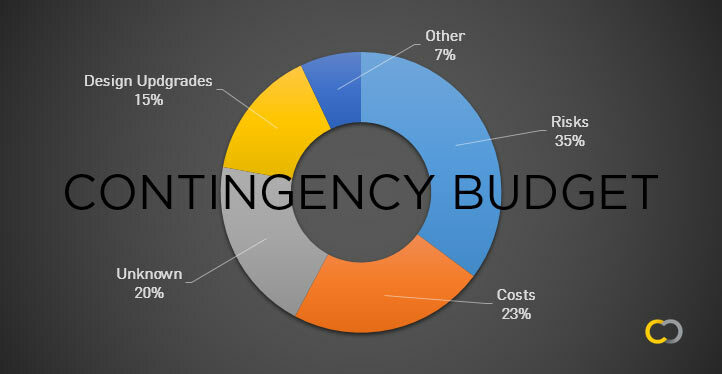 What is a contingency budget? A contingency budget is money set aside to cover unexpected costs during the construction process. This money is on reserve and not allocated to one area of the work, and simply “insurance” against other costs. How much contingency will I need? Most construction projects use a rate of 5%-10% from the total budget to determine contingency. Typically that will cover any extra costs that might come up. However, it is often a bad idea to use a rate less than that, depending on the scale of the project. If issues arise, having budgeting issues could delay the whole project, and prevent work from being completed. Unknowns equal risks. Part of determining contingency is planning for the worst. By identifying risks, like weather and scheduling, you will get a better idea where the contingency budget might go, which will give you an idea of how much you might need. Preconstruction services and planning will help minimize your risks. A complete walk through with designers, engineers, architects, and contractors is a good first step. It’s also a good idea to have complete set of drawings and scope to bid with. Clearly defined scope will help subcontractors know exactly what needs to get done! As projects progress, sometimes light can be shed on opportunities for future prevention, or opportunities for improvements. For example, while the project is happening, owners might suggest an upgrade to a better piece of equipment that is in perfect operating condition, but while walls are open, it is a good time to upgrade. At times, owners will often request a different finish design than was originally planned for. These can add costs, especially when the materials are upgraded. However, as long as there is budget available at the point of finish work, it can be a good idea to use the rest of the contingency budget for upgrades, and a nicer space. If my total project estimate is over my budget, should I cut my contingency? This would not be a suggested strategy. Removing this from the budget might mean you would have to find money elsewhere or pay out of pocket if an issue arises. Budgeting can be a difficult process, and it’s only a good idea to lower contingency as an absolute last resort. What if I don’t use all my Contingency Budget? Lucky you! This means, your project came in under budget and you saved money. Nice preconstruction planning! Want to know more or still have questions?